Taken for granted? Prior learning and the university music degree. In 2000, I completed a dissertation for my undergraduate degree in Music and Educational Studies, at Oxford Brookes University. The dissertation was titled ‘Taken for Granted? Prior learning and the university music degree’ and it set out to examine the continuity between undergraduates’ prior learning and the standards and expectations required at undergraduate level. The study was based upon two case study universities, Oxford Brookes and St Catherine’s College of Oxford University, and employed a number of qualitative methods, namely focus group interviews with groups of first year music students and interviews with teaching staff from both universities. In addition a number of completed student questionnaires were made available to the investigator which had previously been designed and collated, but not yet analysed, by staff from within the School of Music at Oxford Brookes University. The content of several other music degree courses and of various music-related qualifications, such as A-level music, were also examined. The study was, on the whole, of an exploratory nature and therefore an interpretive approach was employed when evaluating the research findings. The study revealed several key issues. Firstly, it emerged that some universities may take it for granted that those students who meet their entry requirements and possess particular music-related qualifications, will possess some common basic skills and knowledge which provide adequate preparation for undergraduate study. However, the study highlighted that students’ prior learning, even where they hold the same qualification, may be highly dissimilar. For example, A-level music seemed particularly deceptive since the scope for specialisation and choice, both between and even within A-levels, made it impossible to assume any consistency in terms the coverage of music history, composition, aural skills, performance and basic study skills. Secondly, many of the music degrees examined in the study contained subject areas which were not covered by either A-levels, Scottish Higher or Associated Board of the Royal Schools of Music (ABRSM) examinations; such content included arts administration, music therapy, popular music, film music and music technology. Yet even where the subject areas covered appeared more similar, the way in which the topics had previously been approached and assessed may not be compatible with the methods employed within universities. Thirdly it was apparent that A-level examining boards may have assumed that universities or some other external party would compensate for any shortcomings within their qualifications in terms of their relationship to undergraduate study. 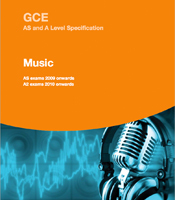 When changes are made to A-level content, for example to ensure closer alignments with GCSE music, there is always a danger that insufficient consideration will be given to the needs of students as potential music undergraduates. Furthermore, music A-levels themselves require only minimum performance standards of around grade 5 or 6, however universities require higher grades as entrance requirements to their courses, necessitating that students have been fortunate enough to have had sufficient support (financial, parental or otherwise) to achieve the higher grades outside their formal schooling. Students may themselves take for granted that an A-level music qualification, and the upper ABRSM grades, will serve as adequate prior learning for a music degree. This message appears to be conveyed and reinforced by school teachers and universities who specify these qualifications as entry requirements. However once accepted on a music degree course some students may for example find that less emphasis is placed upon performance than they anticipated, or that the requirement for written work is greater than expected. Subsequently, some students may find themselves having to rapidly acquire new knowledge and skills and therefore experience different workloads to their peers, through no fault of their own. In response to these known and on-going problems, universities often adapt a back-to-basics approach during the first year, however this results in some students being forced to repeat their prior learning instead of moving on to the more advanced material which they may be keen, and indeed able, to cover. The findings of the study still resonate: it is important to improve the means by which music A-level, Scottish Higher qualification providers and universities work together. This could help achieve greater continuity between undergraduates’ prior learning and their chosen music degree which in turn may better enable them to reach their full potential, both immediately upon entry to university and beyond. This post was based upon the findings available in: Skellington, Jennifer (2002) Changing Music Journalism: An Examination of the changes in Popular Music Criticism in the English Broadsheet Press 1981 – 1988. Oxford: Oxford Brookes University, unpublished Masters Degree Thesis.